I started serving with the Tampa Bay Network to End Hunger (TBNEH) this past August, and it has been a unique and rewarding experience thus far. I came into this position with an interest in food systems and environmental sustainability, with admittedly limited knowledge of the anti-hunger non-profit “world,” so to speak. Being a VISTA under the Hunger Free Communities Network has allowed to me learn much more about this world and have a part in helping to end hunger here. 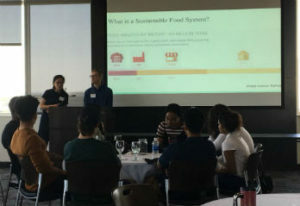 The Tampa Bay Network to End Hunger’s role in the community is to connect individuals and organizations from all fields to each other under the mission to end hunger in Tampa Bay. We are a small staff, but a large network of over 350 members that work together on projects, policies, advocacy, and more that aim to address hunger and poverty. Our members are all volunteers who take time out of their day to work together. 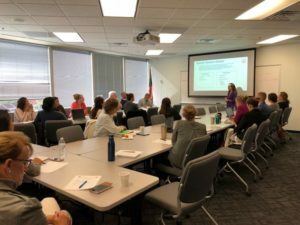 We hold monthly coalition meetings to discuss member updates, listen to member presentations, and report any updates regarding our various work teams. Our work teams are member-led initiatives that are supported by the TBNEH staff. They range from topics such as food recovery, policy/advocacy, childhood nutrition, and more. These work teams allow our members to work on what they are truly interested in. Every year, we take their feedback and create new work teams that are based on what the community wants to focus on. I have had the opportunity to work on and be a part of some great initiatives led by our staff and our members. One of TBNEH’s ongoing projects is updating our Hunger Gap Map and Charity Database on our website, which I continually work on. These tools help individuals quickly and easily find a food pantry or shelter in their area when they are in need. It also helps paint a better picture of the resources that are currently being offered in the community, as well as areas that we can improve upon. Another initiative that we have done every year is host an annual TBNEH conference. This past year, we hosted the 2017 National Sunshine Summit to End Hunger in partnership with the Alliance to End Hunger. I was largely responsible for coordinating and recruiting over 280 volunteers for the meal-packing event at the start of the conference, which helped send over 80,000 healthy meals to those in need. I think one of the greatest things about this VISTA program is the opportunity to take ownership and have input in our projects and decision-making processes. I currently play a big role in managing and recruiting sites to administer our nutrition/food insecurity study in partnership with the Academy of Nutrition and Dietetics. This study aims to gain a more local, community level understanding of hunger, poverty, mental health, and much more from the individuals that experience it themselves. The study is serving as a pilot, and the goal is to spread this study to communities around the country so that it can be used for future policy and projects nationwide. I also work a lot on recovering food that would otherwise be thrown away via partnership-building and the Waste No Food app. This technology makes it simple and easy for donors to give excess food to charities that can feed those in need. Overall, I am proud to be in this VISTA program with TBNEH, as it has shown me that collaboration, communication, and a willingness to serve others are major keys on the journey towards a Hunger Free Community.